This is a favorite with teachers and students. It is a low cost project that it fun to make and the final results are magical. I have been making shoe box theaters since I was a young kid and enjoyed making zoos and pet shops and fairy land scenes. My boxes became even more elaborate and actually a bit bigger when I discovered my mothers rubber stamp collection. Although I do describe it here as a children's type project do not be fooled by it, you can get pretty detailed and even add simple mechanical animated parts to it. At some later point I will put pictures on of some of my giant "shoe box" theaters that have animated dancing ballerinas, another with screaming ghosts with lightening flashes. So don't be fooled into thinking this can only be kids stuff. What is a Shoe Box Theater? 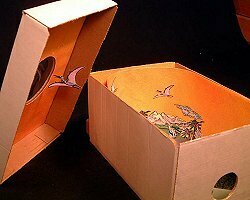 A shoe box theater is a box that has a hole cut in one side of it (to view into) and another one cut into the top of it (to allow light to come into the box). 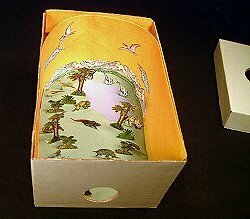 Inside of the box is usually a still scene or environment that depicts a picture. If can have animated or moving parts (for those adventurous and inventive types). The only requirement is that the box be self contained. Some teachers have to box open on top without a peep hole so that the entire scene is visible from above. I prefer to have a closed box with a peep hole so that when you look in it is like a private magical scene hidden within. I believe that it is more interesting and a much bigger surprise to the audience to have them looking through a peep hole. X-acto Knife- You will be able to cut a peep hole and a light hole easily with this. Paper- Have paper to draw on or stamp on plus enough to cover the inside of the box. Colored papers work good for backgrounds and floor coverings as they can help represent sky or earth, etc. I would make the paper you use to create your "players" or characters out of cardstock so they are more sturdy and stand up. Art Stuff- Pens, Colored Pencils, Ink Pads, Rubber Stamps, etc.- You will use these materials to create the images that will be in your theatrical scene. Acetate- Either clear or colored. This is optional as it is used to cover your light hole. It is not necessary but it does keep the dust out, and if using a colored acetate you can add a "look" to your scene (for example if you use a blue acetate and your scene is an under water scene it can add ambiance). Cut your peep hole. You can choose to cut it on the long side of the box which allows for a wide panorama with not much depth, or you can cut it on the short end which allows you to have a narrow but very deep perspective. It is your choice. I like to use an X-acto knife to cut out the hole. The peep hole should be about 2- 2 1/2" across. Cut your light source hole. The size and location of the light source hole depends on what type of scene you want to do. The size of the hole is equal to the amount of light that will come in. Is it an underwater scene, night scene, day scene? If there are specific figures or areas that you want well lit you can cut several holes. The light source hole or holes are cut into the top of the box. Again, I like to use an X-acto knife for this. Making a cyclorama. A cyclorama in our shoe box theater is made of paper and it curves around three sides of the box. By using a cyclorama it eliminates corners and makes the scene look more real and larger. In a real theater a cyclorama is a cloth drape that is curved and hung at the back of the set. When it is lit it looks like there is an endless horizon. 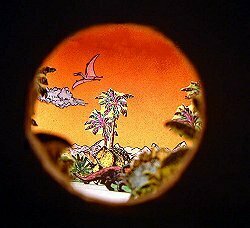 The cyclorama can be decorated with clouds, birds, a sun, fish (if its an underwater scene), mountain ranges, or whatever might possible be a good backdrop. Do not glue this piece into the box yet (that comes later). Create a floor out of paper. Cut a piece of paper to fit the bottom of your box. This can be colored paper or paper that has been colored and or decorated in some fashion. I like to use the old ink pad and cosmetic sponge technique to create a stippled look to my ground. Do not glue this paper into the box yet. Create a ceiling or sky for your box. Cut out a piece of paper to cover the inside of the lid of the box. Be sure to cut openings where the light source hole is. 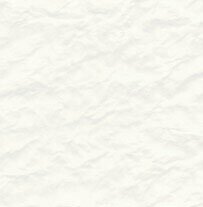 I like to make this paper the same color as the cyclorama so that it looks like a continuation of the "sky". If you have some acetate you can cut a piece to go over the light source hole at this time. If you are using acetate then be sure to glue it in first and then glue in the paper (this way the edges of the acetate are hidden). Create your scene. Stamp your images, draw your people/figures or create the main parts of your scene (whatever they are). Then cut then out leaving a short tab at the bottom. This tab will later be folded back and used to glue down the figure. The larger the figure the bigger the tab. Experiment with tab sizes and you will figure it out very quickly. Take your floor paper and glue the figures onto it and form your scene. You can add stand up grass or fences or houses or whatever scenery you need to make it look great. When you are done with the floor you may want to hang things like birds, fish, or a sun or clouds or whatever from the ceiling on thread or fish line or thin wire. To do this simply glue one end to the ceiling paper and the other to the backside of your hanging item. When the lid is put into place the hanging objects will hang down from the top of the box. It adds dimension and looks cool. It is now time to assemble the box. First attach the ceiling paper to the inside of the box lid (if you haven't already). Next attach the decorated floor paper to the bottom of the box with a small amount of glue (if you use too much you will get wrinkles). Next slip in the cyclorama and glue the two sides lightly. If it is the cut to the right length then you should have a perfect fit and will need only a little bit of glue. If you want to you can cut an additional piece of acetate for the peep hole and glue it on from the inside (this is optional of course). If you wish you can decorate the outside of the box. I sometimes wrap it in appear that has been stamped or decorated. I have also seen one decorated like the outside of a theater with a show bill and everything. Hold the shoe box theater close to a light source when viewing. Do your best to use perspective when planning out your box. For example use smaller objects at the back of the box and larger ones towards the front.